We are excited to bring you a retreat that combines content from our best selling signature programs (and more!) in ONE divine Luxury Babymoon Retreat package to the Byron Bay hinterland. Join us for 3 days and 3 nights at the stunning Gymea Eco Retreat. As a pregnant woman - are you looking for ways in which to prepare for birth that include your partner? Are you craving time out from a busy schedule? As an expectant Dad - do you want to know how you can prepare to support your partner during the birth of your baby? Do you want to feel more empowered and less helpless? Are you looking for ways to reassure and encourage her to have the birth experience that she wants? Would you like to step away from your busy schedule and devote dedicated time to her and your growing child? As a couple embarking on unknown territory, would you like to be guided and supported in a nurturing environment, learning proven skills, techniques and coping mechanisms? Do you want to approach birth confidently and in connection with each other? If yes, this HypnoBirthing & Yoga Babymoon Retreat is for YOU!!! Gymea Eco Retreat & Spa is positioned on 54 acres of secluded naturally undulating rainforest, with stunning views of majestic Mount Warning. It is an eco retreat that provides guests with the opportunity to relax and soak up the beauty of its natural surrounds whilst being close to Byron Bay and the Gold Coast. Gymea Eco Retreat is surrounded by World Heritage National Parks and Wollumbin (Mt Warning), four minutes from the village of Uki, 12 minutes from Murwillumbah and 45 minutes from Byron Bay and its beautiful beaches. There are walks and track through and around Gymea and neighbouring properties. HypnoBirthing is Australia's Premium Childbirth Education program. Carrie Jeff is a gold seal practitioner and member of the HypnoBirthing Australian Steering Committee and can put you in touch with your nearest skilled practitioner if you wish to complete the full program. Classes are are suitable for beginners and all levels are welcome. ​For women during pregnancy, our yoga style is slow, gentle and nurturing, but there is also an emphasis on building strength and stamina. ​​You will get to know your body and learn how to respond to your body's signals; valuable skills for labour and birth. Postures are held passively for an extended period of time, either seated or lying down. Your body will gradually open up and sink naturally into deep, restorative relaxation. A class for couples to unwind and unravel. Retreat hosts and owners of Joymamma, Carrie and Steve Jeff invite you to spend three days and nights in the award winning Gymea Eco Retreat in the Byron Bay Hinterland. Carrie ​is a HypnoBirthing Childbirth Educator, Birth Doula, Prenatal Yoga Instructor. 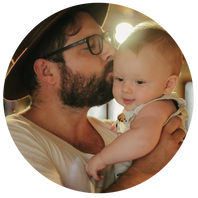 Steve teaches Yoga to Men and is a Prenatal Thai Yoga Massage practitioner, they're based on the Sunshine Coast, Qld, Australia with their three teenage children. We are forever grateful for the amazing birth experience we had. Carrie gave us all the tools and information we needed. Thank you Carrie. You truly are an amazing person and we are so glad we chose you to be a part of our story. ​You will forever be a part of our little family. I would like to credit Carrie for the work in which she does and the support in which she gives. ​Paul and I are so grateful to have met her and would highly recommend anyone who is pregnant or planning on having a baby to see her. Each class Paul would come home and ask more questions and want to know more which for me was great as I think it prepared him to be a wonderful support partner. Indulge in a little 'you time' before the business of parenthood begins. During this unique and special time in your life, feeling nurtured, safe and supported is vital to how your body functions. ​Your emotional state is directly related to the hormones you release. When you take time out to relax, unwind and connect with your partner, the positive hormones you release not only affect you, but also your developing baby. These hormones also play a huge role in birth. Endorphins are our own reserve of pain killers, designed to help us cope with the power of birth. ​Practising hypnobirthing, yoga and meditation during your pregnancy gives you tools and techniques to tap into these positive hormones and prepare you physically and mentally for birth. The education delivered in this Prenatal Couples Retreat is aimed at providing you and your partner important information on how to do this, allowing optimal positive hormonal release. Having a partner who can help you with breathing techniques for the different stages of labour, offer you massage and give you physical support to get into different labour and birth positions means that you can concentrate, stay grounded and focused and in connection with your baby. Studies show that being upright and active in birth leads to a faster, less painful and safe experience for both mother and baby. ​Yoga inspired birth positions and breathing techniques have helped so many women cope with the hours of labour; now your partner can also learn how to support you physically and emotionally and play a part in this life changing event. Yoga Nidra guided meditation, practised lying down, is one of the most popular yoga meditation techniques as it induces a profoundly deep state of rest. It is effortless, enjoyable, soothing and recuperative. ​Meditation helps to prepare you both to stay calm and focused in the lead up to birth and will also help to restore depleted energy reserves as you transition through parenthood. By practising meditation, a woman can learn to choose to create a state of consciousness that is associated with a quicker and less painful labour and birth. Women who meditate in pregnancy have reported easy birth experiences, often painless and often ecstatic. When birth is approached from a place of inner calm and trust, it can unfold in its natural way and be a positive initiation into motherhood." Thai Yoga Massage is different from a normal massage in that it’s fully clothed and uses no oils. It uses a sequence of flowing movements and rhythmic massage to loosen and stretch the recipient’s muscles and to help with the range of motion in the joints. It can help with pains in your back, neck, shoulders, hips, legs and much more. It’s also great for stress relief and brings about a feeling of calm afterwards. 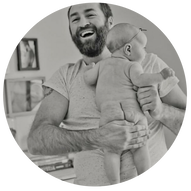 ​Steve will teach partners a gentle, safe and nurturing sequence, guiding them in using therapeutic touch, acupressure points and massage for pregnancy and labour. First 2 retreat bookings receive one FREE Thai Yoga Massage per person. The massage was fantastic and Steve is so lovely. I went home feeling very relaxed and centred again - and refreshed. I particularly liked how in Thai massage it stretches/lengthens you out again rather than just a focus on muscles, and it was very gentle and restorative. Thank You! Steve was friendly, professional and knowledgeable. I felt completely relaxed and slept very well that night! Thanks again for providing the service. We will have tailored catering services; a bounty of wonderful, enriching and healthy food that is generally locally sourced and organic where possible. Gymea's Healing Spa offers organic facial, body treatments and massage. Why Come Away on a HypnoBirthing & Yoga Couples Retreat? In a retreat setting, you move away from the outside world of busy schedules and daily demands and you are able to enjoy dedicated time with each other to fully absorb the education and content on offer. Your Instructors - Joymamma owners, Carrie & Steve Jeff, are on retreat with you! There will be time throughout the retreat to ask all your questions in a relaxed environment. You will be guided and supported by experienced and passionate teachers. Spending time on retreat immersed in our educational programs allows you additional time to ask questions, connect more personally and delve deeper into the content, something that can't be obtained from a book or online course. Learning and practising on retreat gives you time and space to reflect and take ownership of the massive role of becoming parents. Fully commit your time and energy into classes and workshops, without the stress of racing from work or other appointments. You can attend all the important classes and workshops in the daytime, rather than trying to absorb content late into the evening, when attention levels reduce, allowing for plenty of precious sleeping hours. On retreat, you and your partner are on the same schedule! There are no other commitments! Once you remove yourself from your everyday environment, you are released from daily habits, thoughts and patterns. In such a quiet, peaceful space where we take care of you, you are then able to focus on each other, your baby and yourself. You both have space to connect on a level that can allow you to trust, let go and surrender into the journey ahead. ​You will be nurtured and cared for from the moment you arrive. Carrie is a wonderful and nurturing teacher. I wanted to learn how to help my amazing wife get through her first birth without fear or pain and she achieved both. If you want to be educated and give your partner the absolute best possible preparation before birthing, and learn how to actively be involved and be an integral part of welcoming your new son or daughter into the world – sign up!! Upon my first Yoga class I felt incredible. I felt so uplifted, invigorated and overall amazing. After HypnoBirthing we also felt so much more closer as a couple. I loved the positivity that surrounded it. I love that it not only armed me with information for my birth, but life in general. I know that I need to slow down sometimes and just BREATHE. I hear every dad say how awesome it is to see bub for the first time and I agree. The second best thing I've ever seen was the love of my life turn into a goddess, a warrior, a picture of focus and strength and to be in control of what was happening! And I was able to help her to do that . Love all of the classes, can't get enough. Hubby and I have completed the hypnobirthing course & active birth class together and I've enjoyed prenatal yoga, restorative yoga and yoga for birth. Highly recommend Carrie and all of her knowledge. Pregnancy can be an anxious time and a retreat allows BOTH of you to take time out, slow down and focus on each other. As soon as you arrive, everything is done for you, on retreat you can dedicate this time to letting go and fully relaxing. Your baby senses all that is going on in the world through their mother's feelings and emotions. Creating timeout from busy work/life schedules enables your baby to feel safe and nurtured too. Getting to know other pregnant couples builds a magical group energy. Create new friendships with like-minded people all on the same journey; connections that can last long after the retreat has finished. Whilst HypnoBirthing, Yoga and Meditation are aimed at achieving a more comfortable birth experience, the tools and techniques are for life. Creating time and space in your day to practice throughout your pregnancy helps establish a great physical, mental and emotional state that can be maintained throughout the postnatal period and your journey through parenthood. Carrie thank you SO much for guiding my husband and I so gracefully through the journey of pregnancy and motherhood (parenthood). We couldn't have done it without you! 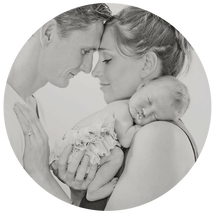 The birth of our daughter Poppy was the most incredible experience of my life and it created such an amazing bond between my husband and I because we did it together. Thank you from the bottom of my heart. ​​We will personally look after you; educate you and share all our knowledge with you in a relaxed, fun and restorative getaway. Pay a deposit now and secure your place on this exclusive HypnoBirthing & Yoga retreat experience. ​Bookings received after 31 July 2019 will require full payment. Spend 3 days and 3 nights at the award winning Gymea Eco Retreat, eating nutritious meals, practising yoga and meditation, learning about HypnoBirthing and Active Birth with a group of like-minded souls who are ready to deepen their connection with each other, with themselves and their baby. AND receive our support and guidance to prepare for one of the biggest events of your life - having a baby! I've never practiced yoga before, and I'm not very flexible. Will it be difficult? I can't meditate - do I need to do that bit? You don't need to do anything you don't want to - but we would love you to join in the meditation practice. Yoga Nidra is one of the easiest ways to experience guided meditation. Is this the full HypnoBirthing program? No, the HypnoBirthing program is best run over a period of 5 weeks. The session on offer on this retreat is a taste of what HypnoBirthing is all about. Carrie Jeff is a gold seal practitioner and member of the HypnoBirthing Australian Steering Committee and can put you in touch with your nearest skilled practitioner if you wish to complete the full program. Is the education offered a replacement for hospital antenatal classes? The retreat program is designed to educate you about birth - and PREPARE you for birth. It can complement or replace hospital classes, so no need to do both. You will be provided with resources to help you practice techniques and tools that will help in labour and birth, something which hospitals rarely provide. Spring at Gymea is beautiful, with temperatures ranging from 24-27 deg c during the days. Will there be vegetarian and vegan food available? I have certain food intolerances, can I get my own special meals? Yes, if you have specific dietary needs, the chef can work with you providing a delicious substitute menu. How many weeks pregnant do I need to be to come to this retreat? You are welcome at any stage after your first trimester. Depending on the distance you are travelling and your mode of transport (i.e. flying), we recommend you consult your doctor and insurance company if the retreat dates fall close to your due date. We have already done a hypnobirthing course, can we still come? We would love to have you along! The Hypnobirthing session can act as a refresher for you - or you can spend that time exploring the retreat surrounds - or indulge in a little spa treatment! Once your booking is received, we will send you a detailed information pack on everything that you need to bring. ​Check-in time is after 1.00 pm on Thursday 19 Sept and check-out is by 9.00 am on Sunday 22 Sept.
Rates quoted are per couple. A $500 deposit is required before a confirmation can be issued. Final payment of the remaining balance must be made by 31 July 2019. Failure to make the final payment on or before 31 July 2019 will make the booking subject to automatic cancellation and loss of deposit. All rates for the retreat are quoted in Australian dollars. Please consider travel insurance - see below. In the unlikely event that we will have to make any changes to these arrangements, we will advise you at the earliest date possible. If, for reasons beyond our control, we are unable to proceed with this retreat, we reserve the right to cancel your reservation and refund you in full. As payments are not 100% refundable, we highly recommend you consider all inclusive travel insurance which covers all your expenses in the event that you need to cancel your booking, need medical treatment, or emergency evacuation. We are not responsible for any delay, additional expense or inconvenience caused directly or indirectly by events outside our control such as civil disturbances, fires, floods, severe weather, natural disasters, acts of Government etc. We are not responsible for any and all claims, including any accidents occurring on the Retreat.